We’re passing this along to to remind racers that safety equipment is every bit as important in racing today, as in hockey. 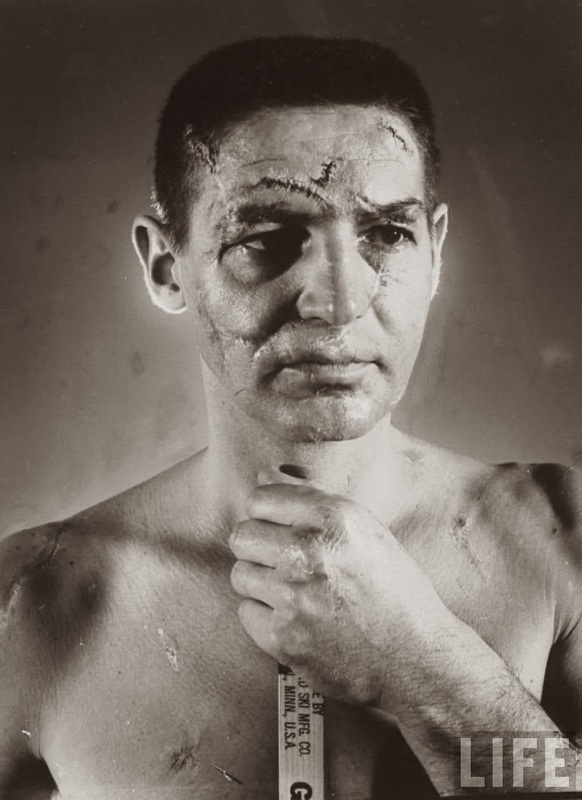 This face belongs to Terry Sawchuk, a 36-year-old goalie for the Toronto Maple Leafs. Re-created here, by a professional make-up artist and a doctor, are some of the more than 400 stitches he has earned during 16 years in the National Hockey League. Terry Sawchuck’s face was bashed over and over, but not all at one time. His wounds healed. The scars weren’t easily seen – except for a few of them. The re-creation of his injuries was done to help show the extent of his injuries over a span of years. This famous photo from Life magazine, it’s a great photo, but ironically, it didn’t tell half the story of Sawchuk, who was a very troubled man off the ice. He suffered a dislocated elbow playing rugby and hid it from his parents. The lack of medical attention caused his right arm to be half a foot shorter than his left, was extremely crooked, and caused him considerable pain for the rest of his life. He was distant, angry, miserable with teammates and fans alike, kept to himself, and suffered from what we would now call depression or anxiety. In fear of losing his job, he kept injuries to himself, and suffered quietly through many elbow problems, appendicitis, a collapsed lung, severe hand problems, broken foot, and too many cuts to count. His playing style of an extremely low crouch left him with a permanently bent back and ruptured discs, which meant that he couldn’t sleep longer than 2 or 3 hours at a time. This was all a bit much for Sawchuk to take, and he began to drink heavily. His life off the ice was generally a total uproar. Alcoholism and spousal abuse was the name of the game in the Sawchuk household. He had numerous affairs, and eventually impregnated a woman outside of his marriage, before finally being divorced by his wife. Sawchuk died after a drunken scuffle with teammate Ron Stewart, arguing over the phone bill they shared. Sawchuk fell, suffering damage to his liver, and died in hospital after having his gallbladder removed, as well as unsuccessful attempts to stop the bleeding from his liver. The photo, on its own merits, is excellent. Considering what we now know about Sawchuk’s life, the picture becomes amazing. And now let’s write something about the masks. Back in the day coaches believed that a mask would limit a goalies field of vision, however they would wear them in practice. They also believed that goalies were supposed to be fearless type (not to shy away from a puck). Also there was that macho mentality among players in the league (not wanting to be seen as weak, injured, or ‘scared’). Masks became necessary when sticks started to be curved. With flat sticks players couldn’t really get much speed or lift, thus making masks less vital. And also rules did not allow goalies to go down on their knees. The butterfly style you see today was illegal back then. Jacques Plante was the first goalie to ever wear a mask in the NHL, after demanding to wear one for a long time. He wasn’t allowed to wear it until he took a shot off of the nose that took 45min to stitch up. It was during this time that he gave his coach an ultimatum: either let him go on with his practice mask on, or lose the best goalie. So, he wore his mask. The photo is Life Magazine property.